Our first destination in Italy was the capital city, Rome, where of course we spent several days touring all the ruins of the Old Quarter. 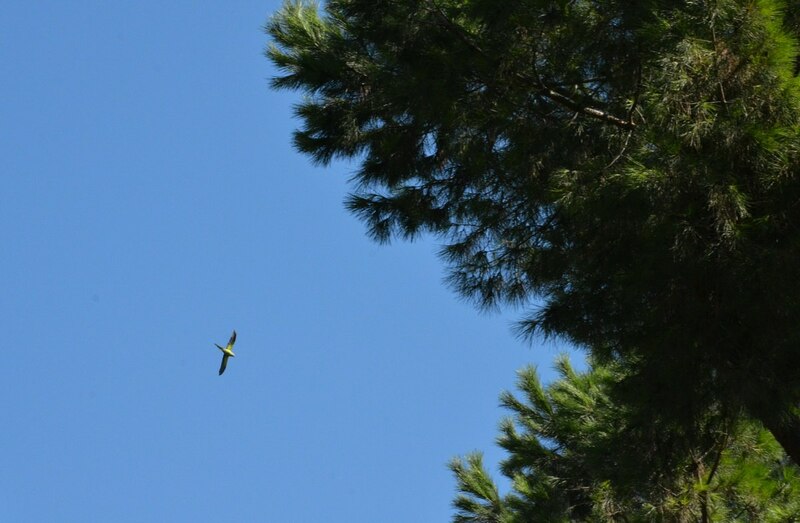 While exploring Palatine Hill, I heard an unusual bird song and then spotted a pair of Rose-ringed Parakeets winging through the sky before landing in the top of a very tall tree. We were delighted! 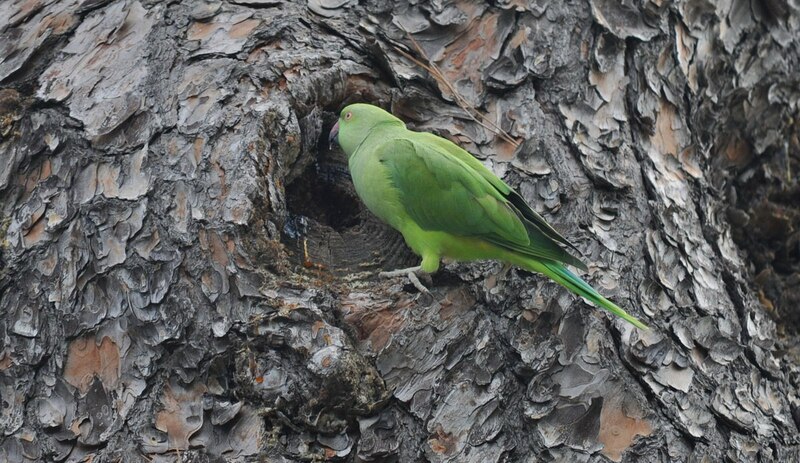 By this time, Bob and I were taking care to note any birds that crossed our path as we explored different areas of the city, and we did see other Rose-ringed Parakeets as we walked the streets, some even in the couple of trees growing in Piazza di Spagna near our hotel. 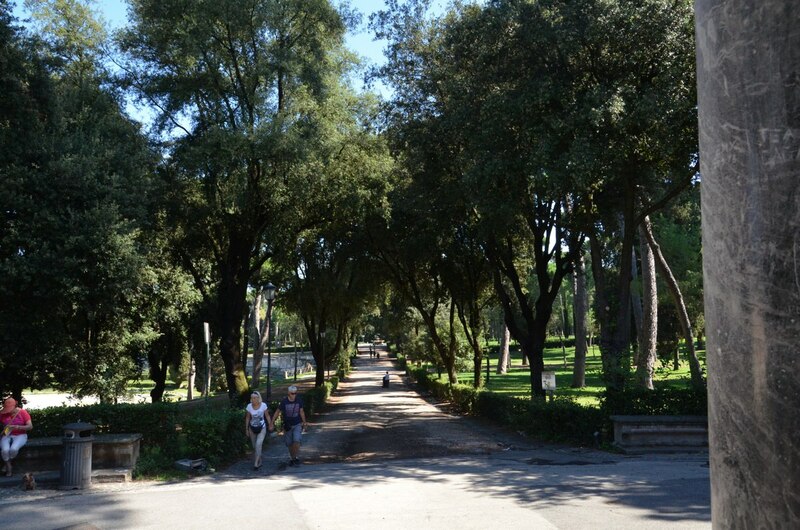 Our closest encounter came the day that we took a break from touring ancient architecture and instead visited Villa Borghese Park for a literal change of scenery. 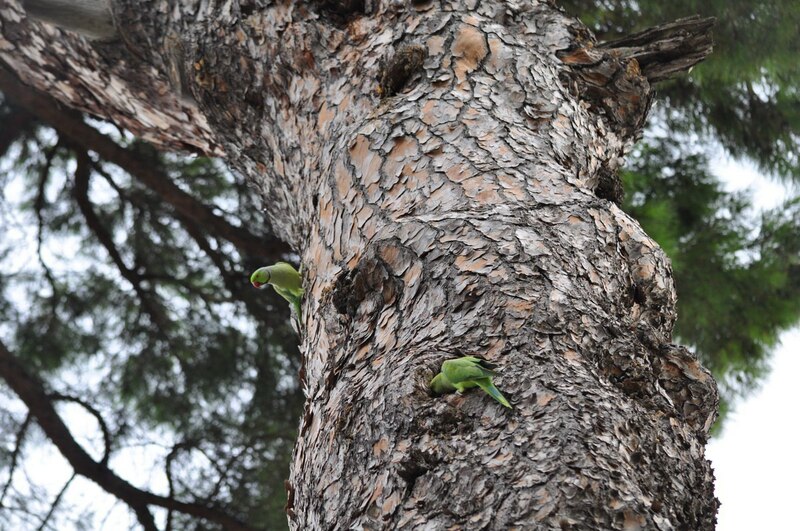 All around the city of Rome, impressive examples of Umbrella Pines (Pinus pinea), or Stone Pine Trees as they are also called, seemed to attract the brightly-coloured Rose-ringed Parakeets. We would often see them performing fast and direct flights from one tree to another, always with rapid wing beats. 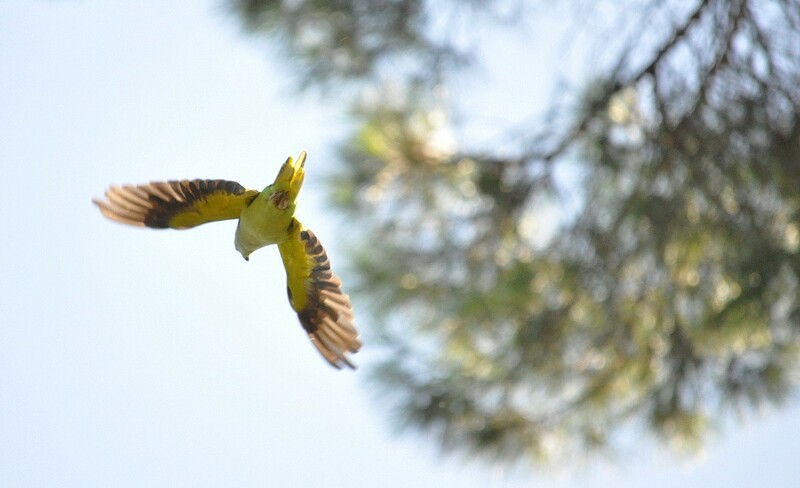 As one such Rose-ringed Parakeet burst into flight from its perch on high, I captured a photo that reveals the vivid green plumage of the body as well as the greyish undersides of the primary and secondary feathers on the wings. It is when these parakeets fly that their dark flight feathers are conspicuous. 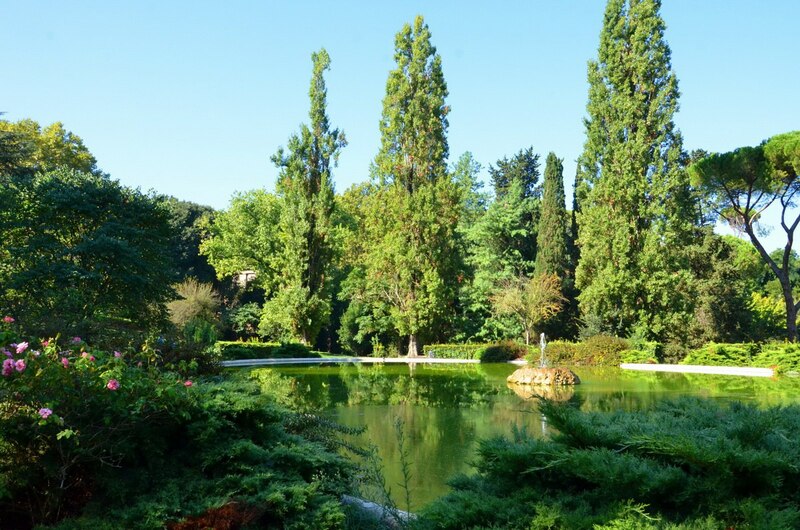 As Bob and I strolled the pathways in Villa Borghese Park, a constant string of squawks was emitted by Rose-ringed Parakeets as they soared above us through the tree canopy. At last, we found several of these gregarious birds clinging to the trunk of one of the Umbrella Pines. Rose-ringed Parakeets feed on nuts, seeds, nectar, fruit, blossoms, and buds, so we wondered if they were dipping into a bit of tree sap. These birds do employ their bill like a third foot when climbing, but they did not appear to be scaling the tree. 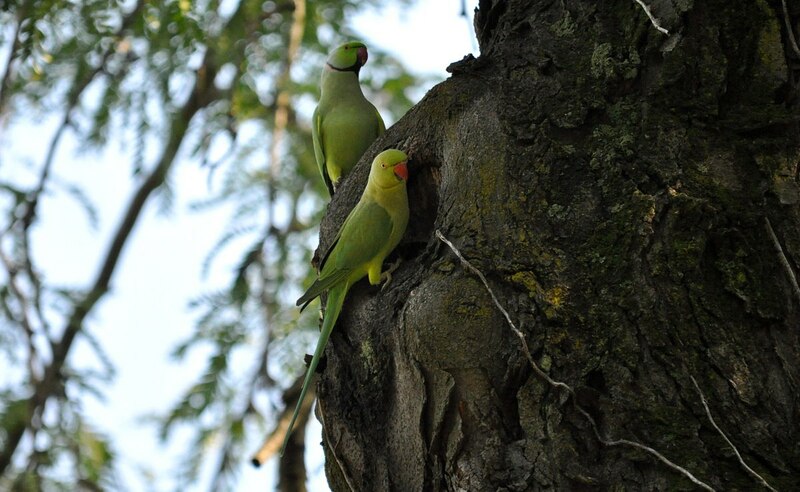 This beautiful pair of Rose-ringed Parakeets was preoccupied on the side of a different tree. 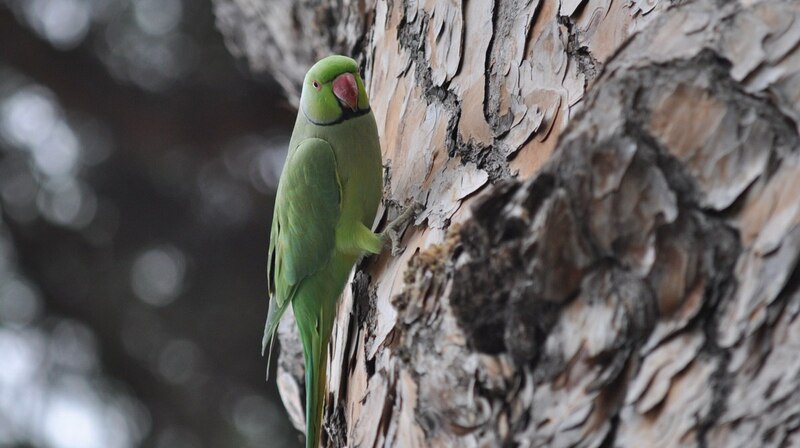 It is unusual for Rose-ringed Parakeets to be seen either alone or in a pair except during breeding season. From what I could learn, Rose-ringed Parakeets breed between September and December, so perhaps this pair was scouting out a possible nesting site. They will often utilize a snug hole in a tree or another bird’s abandoned nest cavity. This handsome male can be distinguished by the black neck ring that wraps around its chin and cheeks and then blends into a pink collar at the nape of the neck. We couldn’t believe that sufficient sunshine actually illuminated this particular Rose-ringed Parakeet because most often the birds were in pretty deep shade. All the nuances of the bird’s subtle shading can be detected such as the subtle blue wash on the neck, the central blue tail feathers that are tipped with yellowish-green, the bird’s red-ringed yellow eye, and the deep red upper mandible. Rose-ringed Parakeets are not native to Italy. They are tropical birds whose natural range includes parts of Africa, India and Asia, however feral populations have popped up in a number of cities scattered around the world. Long popular as pets, many Rose-ringed Parakeets have escaped over time and managed to eke out an existence in their newly-adopted habitats. They are social birds that adapt well to urban settings wherein they have multiplied and formed breeding colonies. 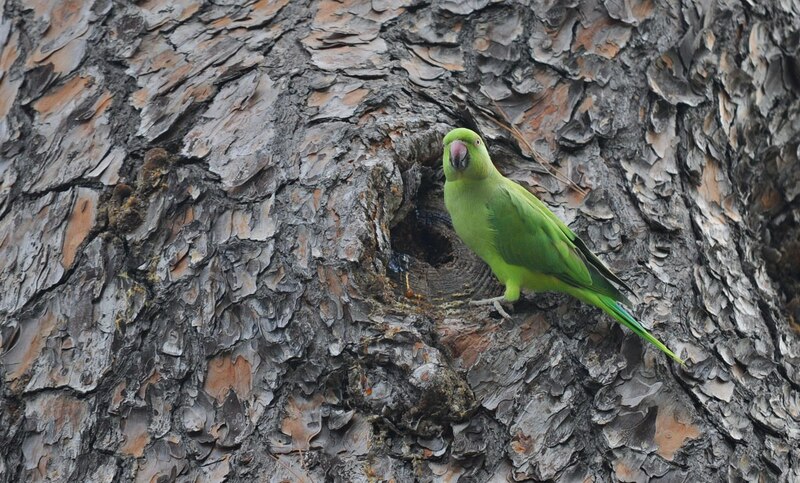 It is easy to imagine how Rose-ringed Parakeets could adjust to an urban setting. The varieties of flowers, fruits, vegetables and seeds in private gardens and local parks would provide a constant source of food. But if slim pickin’s was ever a concern, flocks of these parakeets are quick to move into the surrounding countryside and raid orchards and crops. 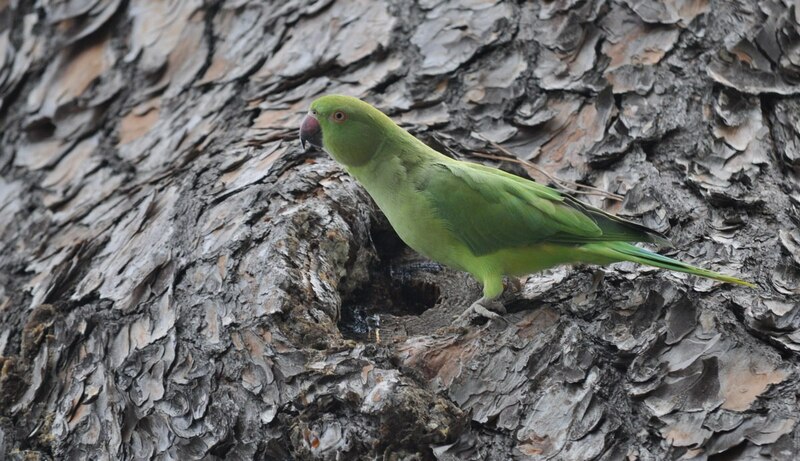 As Bob and I observed this female Rose-ringed Parakeet, recognized by the lack of a black neck ring, she dipped her broad round pinkish-red bill into the tree cavity over and over again. Each time she lifted her head, liquid could be seen to drip off the tip of the hooked bill. Perhaps water had accumulated in the depression and the bird just needed a drink. It is quite understandable that a feral colony of Rose-ringed Parakeets exists in Rome because ancient Romans, over hundreds of years, had captured a subspecies of these parakeets from Africa to use as captive novelties. The birds are striking to look at and are capable of learning up to 250 words that could be repeated to entertain owners and guests alike. 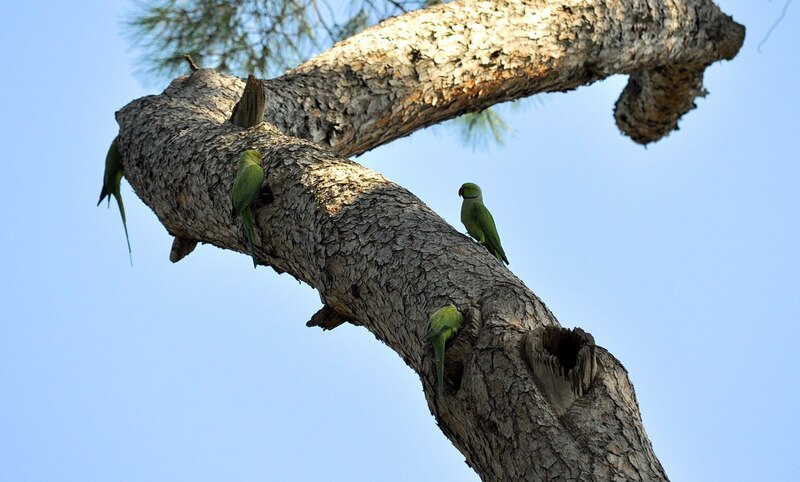 So it is no wonder that Bob and I were struck by the flashy green parakeets when we first caught sight of them. 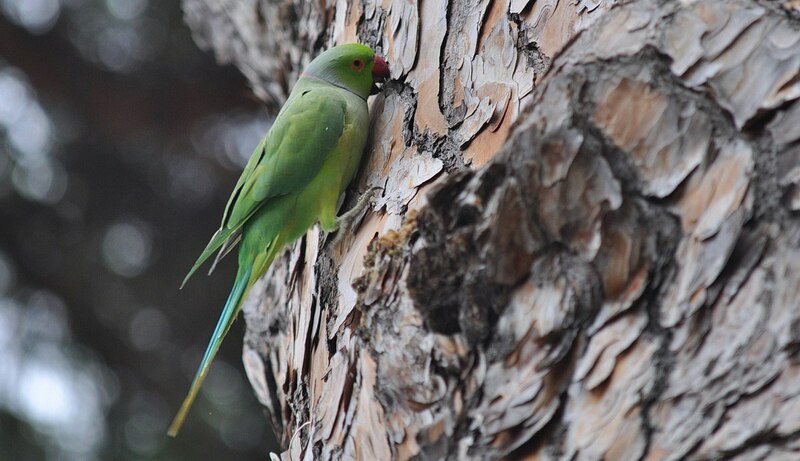 Rose-ringed Parakeets are not large birds; they grow only to a length of 40 centimetres (16 in) including the graceful long tail, but they sure stood out against the muted tones of the Pine Tree bark. Good thing because they never ventured close to the ground.